Stochastic effect: Even minimal radiation doses have an effect. They increase the likelihood of developing malignant tumors (somatic effect) and sustaining genetic damage (genetic effect) that might otherwise also occur without interference by man-made technology though less frequently. There are therefore no real threshold values below which the administration of x-rays is totally safe. This effect is also called the stochastic effect. It is a fundamental effect associated with the use of all ionizing radiation in diagnostic radiology and the major reason for the general radiation protection efforts today. Nonstochastic effect: Higher radiation doses produce direct effects. These are, for example, damage to the skin, the hematopoietic bone marrow, and the eye lens, and radiation syndrome. A clear relationship exists between the severity of the disease and dose. These nonstochastic effects occur mainly in radiation therapy. In interventional radiology and neuroradiology such as cardiovascular stenting or percutaneous treatment of complex arteriovenous malformations in the CNS, nonstochastic effects such as radiation-induced erythema, ulcerations, or hair loss have been reported anecdotally in patients undergoing complex procedures exposed to prolonged fluoro-scopy, for example. Obviously this also poses a serious threat to the physicians involved. Radiation-induced lens injury has been reported in interventional radiology. 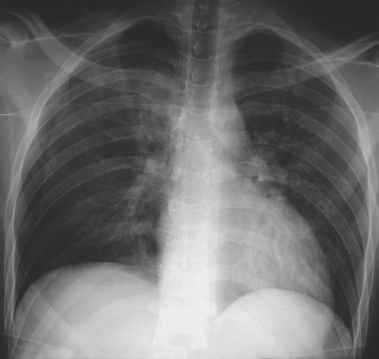 Wilhelm Conrad Röntgen died owing to an iL A ji ileus 28 years after his discovery of x-rays. P jTJt,_^ The young and famous surgeon Sauerbruch, a pioneer of intrathoracic surgery, tried to save him with a last-minute operation but was unsuccessful. A large-bowel carcinoma as one likely cause of the ileus could only be attributed to the stochastic effect. X-ray tubes were prohibitively expensive even in those early days—and they survived but a few exposures. For that reason Röntgen's total radiation exposure was probably low. Apart from that, the cautious old fox used to leave the laboratory while his experi-mentswere running. Interestingly enough, there are no radiographs of Roöntgen himself, but there exists one of the hand of—you guessed it—his wife Anna-Bertha. Figure 5.2 shows a typical nonstochastic effect from the early days of radiology as suffered by Max Levy-Dorn, one of the pioneers and first victims of the new technology.